There are just three SLAPP statutes, 425.16, 425.17 and 425.18, and they continue to be a work in progress as the Legislature works out the bugs. Indeed, the statute requires that any party filing or opposing an anti-SLAPP motion must send a copy of the face page of the court document to the Judcial Council, so the use of these statutes can be monitored. 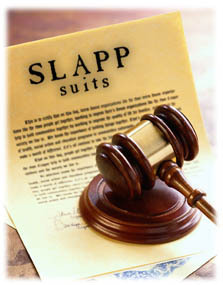 California enacted Code of Civil Procedure § 425.16 in 1992, a statute intended to frustrate SLAPPs by providing a quick and inexpensive defense. It provides for a special motion that a defendant can file at the outset of a lawsuit to strike a complaint when it arises from conduct that falls within the rights of petition or free speech. The statute expressly applies to any writing or speech made in connection with an issue under consideration or review by a legislative, executive, or judicial proceeding, or any other official proceeding authorized by law, but there is no requirement that the writing or speech be promulgated directly to the official body. It also applies to speech in a public forum about an issue of public interest and to any other petition or speech conduct about an issue of public interest. California’s Code of Civil Procedure § 425.17 corrects what the Legislature found to be abuse of the anti-SLAPP statute (CCP § 425.16). Signed into law on September 6, 2003, this statute prohibits anti-SLAPP motions in response to certain public interest lawsuits and class actions, and actions that arise from commercial statements or conduct. Section 425.18, signed into law on October 6, 2005, was enacted to facilitate SLAPP victims in recovering their damages through a SLAPPback (malicious prosecution action) against the SLAPP filers and their attorneys after the underlying SLAPP has been dismissed. (b)(1) A cause of action against a person arising from any act of that person in furtherance of the person’s right of petition or free speech under the United States or California Constitution in connection with a public issue shall be subject to a special motion to strike, unless the court determines that the plaintiff has established that there is a probability that the plaintiff will prevail on the claim. (c) In any action subject to subdivision (b), a prevailing defendant on a special motion to strike shall be entitled to recover his or her attorney’s fees and costs. If the court finds that a special motion to strike is frivolous or is solely intended to cause unnecessary delay, the court shall award costs and reasonable attorney’s fees to a plaintiff prevailing on the motion, pursuant to Section 128.5. (e) As used in this section, “act in furtherance of a person’s right of petition or free speech under the United States or California Constitution in connection with a public issue” includes: (1) any written or oral statement or writing made before a legislative, executive, or judicial proceeding, or any other official proceeding authorized by law; (2) any written or oral statement or writing made in connection with an issue under consideration or review by a legislative, executive, or judicial body, or any other official proceeding authorized by law; (3) any written or oral statement or writing made in a place open to the public or a public forum in connection with an issue of public interest; (4) or any other conduct in furtherance of the exercise of the constitutional right of petition or the constitutional right of free speech in connection with a public issue or an issue of public interest. (j)(1) Any party who files a special motion to strike pursuant to this section, and any party who files an opposition to a special motion to strike, shall, promptly upon so filing, transmit to the Judicial Council, by e-mail or facsimile, a copy of the endorsed, filed caption page of the motion or opposition, a copy of any related notice of appeal or petition for a writ, and a conformed copy of any order issued pursuant to this section, including any order granting or denying a special motion to strike, discovery, or fees. (e) If any trial court denies a special motion to strike on the grounds that the action or cause of action is exempt pursuant to this section, the appeal provisions in subdivision (j) of Section 425.16 and paragraph (13) of subdivision (a) of Section 904.1 do not apply to that action or cause of action.